You can’t go around giving a f*ck about everyone and everything and other people’s dramas, pet projects, new kale smoothie recipes or what your in-laws said. We’re overwhelmed with demands on our time and obligations, feeling anxious and guilty as we’re being pulled in ten different directions. We go around say “yes” to everyone else’s demands but our own. –But there’s something we can do about it. Not giving a fu*k means taking care of yourself first. Not giving a fu*k means allowing yourself to say no. 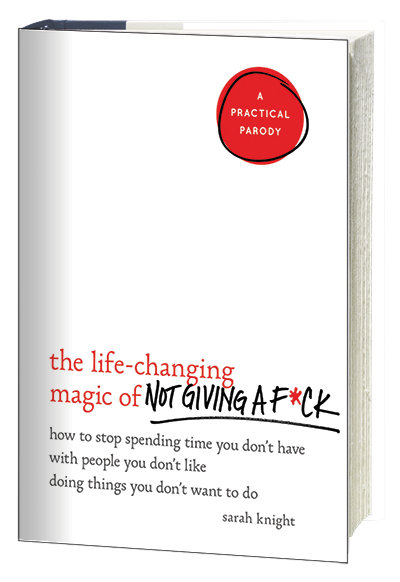 Not giving a fu*k means releasing yourself from the worry, anxiety, fear, and guilt associated with saying no. Not giving a fu*k means reducing mental clutter. So you need a F*ck budget, because if you constantly give your all to others, you’ll be left with nothing for yourself. You must remember that you have limited number of fu*ks to give in your days. Give a fu*k about what you think your boss thinks about you; keeping up with Games of Thrones, handwriting thank you cards; raising money for your best friend’s neighbours mothers blind dogs charity; and the best crock-pot recipes for Meatless Mondays – and this will leave you with NO fu*ks to give about the really important stuff in your life (like your career and spending time with people you love!). So, the next time someone asks something of yourself, STOP! Don’t say “yes” right away. You have another option. Think about the amount of time, resources and money that will be required when saying “yes” to other people’s constant requests. How will you feel the day of this request? Will you be excited or will you be dreading the day? We all start off with the same number of f*cks in a given day, so think long and hard about who and what you’re giving your attention and resources to, BEFORE you say “yes” I’ll be there, “yes” I’ll do that for you, “yes” I’ll pick that up for you/drop that off for you…etc. Ask yourself: CAN I AFFORD TO SAY YES? Will I feel good about saying yes? Or will I secretly resent the request and feel like a loser for my inabilities to say no? Start saying “NO” to others and “YES” to yourself, more often. I’ve been doing this for a long time. But I used the sentence “not my circus, not my monkey”. But saying “ I don’t have enough fucks” love it even more.